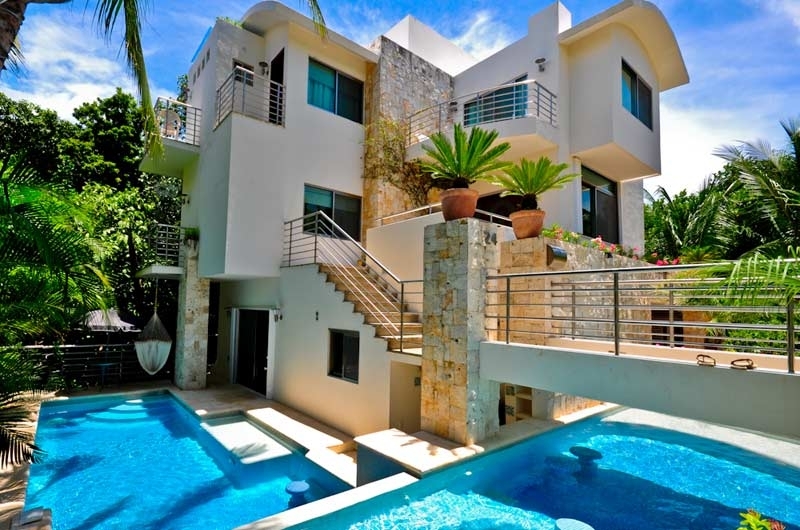 Casa Prieto is a stunning, modern and fully equipped villa, located in Playacar Phase 2, Playa del Carmen. It's centrally located just after a nice set of ancient Maya ruins, about a 20 minute walk into town and only 3 minute walk to a secluded and tranquil beach in Playacar Phase I. Although located in a gated community, once you step foot on the premises of Casa Prieto, you instantly feel like you've walked into a tropical haven with a surrounding private cenote (undergrown river & cave system) and waterfall. This 5 bedroom villa comes fully equipped and boasts unique amenities such as in house pond hosting tropical fish and turtles, a FULL SPA with steam room, hot tub, and sauna, roof top Jaccuzzi with views of the incredible spectrum of turquoise waters. 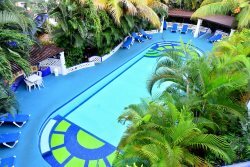 Guests also have access to the gated community's pool and tennis courts. Additional accommodating features include studio bedroom with kitchenette and private entrance from pool, wet bar, separate office with pull-out couch, fully equipped kitchen, high ceilings, and alfresco dinning. * Rates are per night and in US Dollars.